Agile Management ? CSD Certification Course in Jakarta Jakarta?s economy is dependent on various sectors including banking, financial services, trading and manufacturing of chemicals, automobiles and biomedical equipment. The capital city of Indonesia is home to numerous international corporationsalong with Information Technology organisations making their presence felt. This brings to the table a pool of career opportunities for skilled professionals who are willing to go the extra mile. KnowledgeHut, a globally recognised e-learning academy through its CSD Certification in Jakarta comes as a boon to aspiring students and professionals eager to climb the rungs of the corporate ladder; with a little push. With the CSD training in Jakarta offering a holistic approach to assimilating knowledge via theory and practise sessions, this course comes as a top bet for professionals. What is the course all about? CSD course in Jakarta thoroughly explains the concepts behind Agile and Scrum basics while coaching about Sprints. Lengthy discussions about Scrum roles, ceremonies and Artifacts are supported by training of Test Driven Development (TDD), Acceptance Test Driven Development (ATDD) and Behavior Driven Development (BDD). Aspirants can make the most of the course which includes a classroom exercise on BDD along with tools like Gherkin, Fitnesse, Selenium, Gherkin and Cucumber. Certified Scrum Developer Training in Jakarta delivers a solid understanding of Agile Architecture and Design supported by SOLID design principles, Design Patterns and Anti-Patterns. Captivating exercises on SOLID design principles and comprehensive discussions on collaboration push aspirants to think and implement. All these are discussed through a Code demo and activities that come as part of the quick-reference course material. Benefits of the course: CSD Certification in Jakarta is the reward that comes from an understanding and implementation of the Agile model. 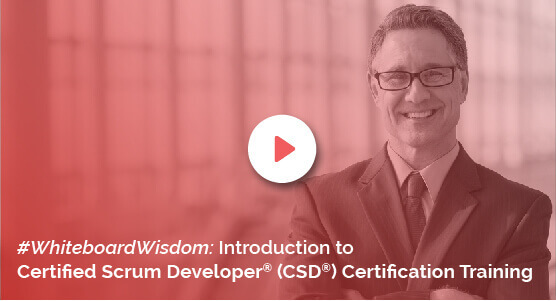 Preparing participants to apply the fundamentals of Scrum, this course focuses on putting in place better design alternatives while supporting collaborative code ownership. The KnowledgeHut Way: Certified Scrum Developer Certification is a comprehensive course conducted by Scrum Alliance certified trainers. The affordable cost also covers the exam fee; blending the advantages of convenience and affordability.